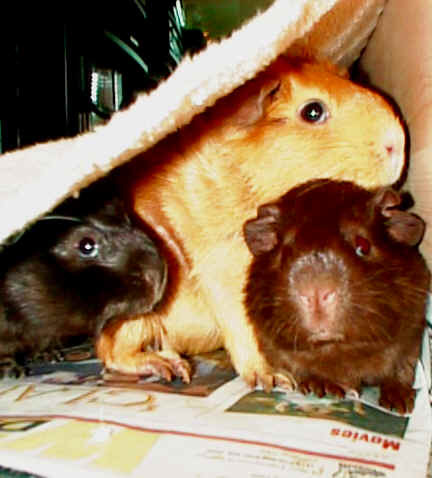 Why we started a Guinea Pig Rescue! 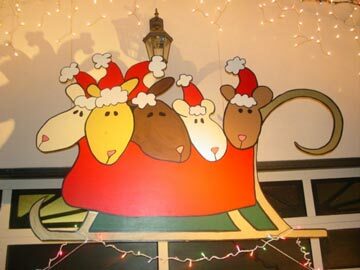 Meet Teresa and the Cavy Spirit Team! I started the rescue with my significant other at the time -- Robert. We ran the rescue together for about five years. Now, it's just me and the volunteers. 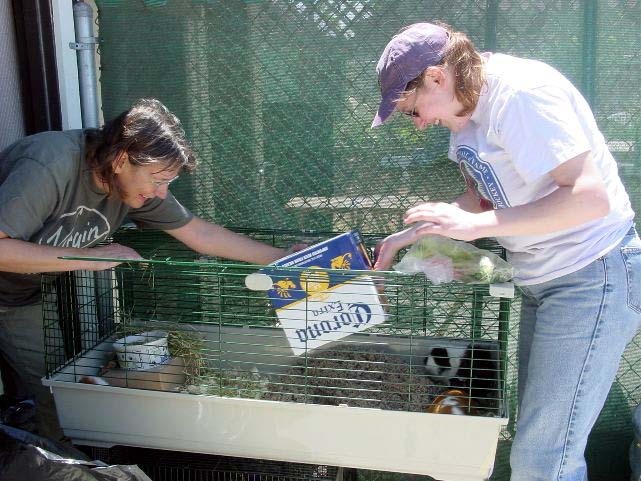 But, the rescue has expanded to include some special volunteers who have been with Cavy Spirit from the beginning -- people like Leah and Jackie and others. 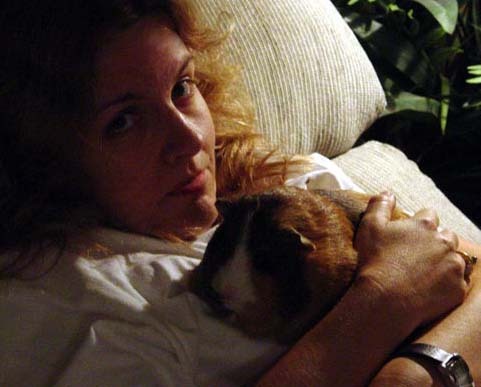 I used to average 40 to 60 guinea pigs in my home at any one time. But, recently, due to being single and financially stretched beyond my limits (rescuing is a serious money drain), I've had to cut back significantly. I now average under 20. I no longer take in private surrenders (something that happens to most rescues over time) and try to get the dire shelter cases adopted out directly from the shelters or work with foster homes. Private surrenders are coached into other options. I have to keep enough room and resources available for the occasional returns I am contractually and morally obligated to take back in for whatever reason. 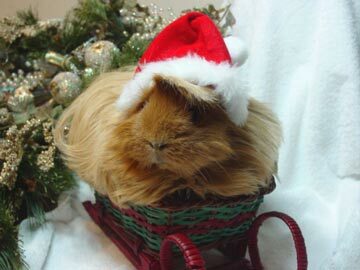 Cavy Spirit still has many, many guinea pigs for adoption from foster homes and some here. And of course we are more than happy to assist with any shelter adoptions as well. We continue to be very active and vocal about the issues and promote proper care and education. It's been the big rescues and the really sad cases that have helped bring people together from all over the world, but especially in the San Francisco Bay Area, lending support in a variety of ways. And for while it seemed that California was having a very high incidence of large abuse and abandonment cases. It had been my position all along that the only difference about what was going on in California as compared to the rest of the country was that by being more involved with animal control officials, we got involved early with some of the big seizure and abuse cases, took photos, and leveraged the power of the internet before the animals could be quietly put down with very few people knowing about it. While Cavy Spirit started out as a two-person project in our home, through both working with the local shelters, the websites, and posting on the guinea pig-related forums, the guinea pig rescue effort for the Bay Area evolved into an ever-changing, yet core group of people, who have also contributed blood, sweat, tears, time and money to the cause. And it's been the blood, sweat, and tears that has forged a strong bond between many of us. So many people have done and contributed so much that I couldn't even begin to list them all. 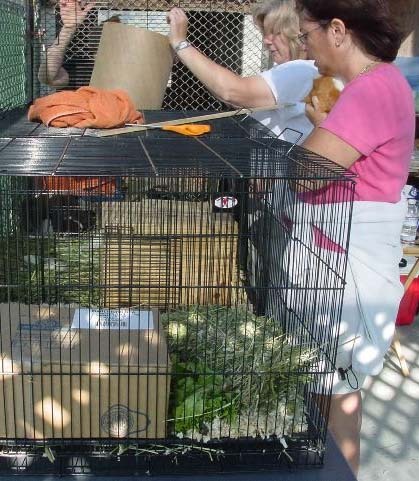 But very special recognition must be given to two ladies (and their families), without whom, Cavy Spirit would not have been in the position to have assisted with the rehoming of approximately 1000 guinea pigs and directly or indirectly helping improve the lives of many more. 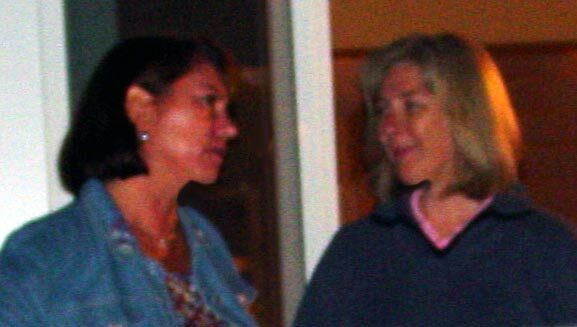 Jackie has been an inspiration, a confidant, the voice of reality and reason, and there from the beginning. 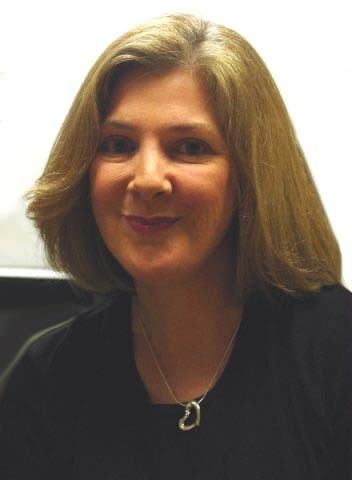 She's spent countless hours helping with pigs, feeding, cleaning cages, driving to and from and managing vet appointments, adopter and rescue travel, delivery and appointments, shopping for and delivering supplies and bedding, helping edit and contributing to the websites and articles, helping answer emails, attending and managing special events which take a enormous amount of time and energy. 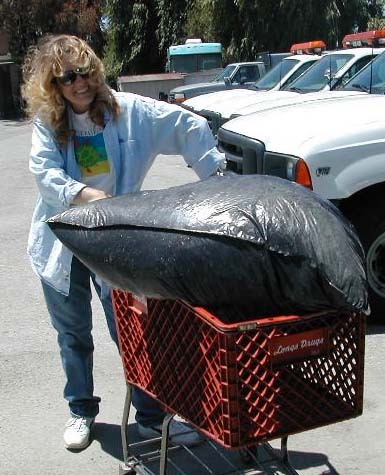 She was the key person involved in the Hollister rescue and the trip across the country. She has coordinated multiple other mass rescues and done multiple long-distance trips. 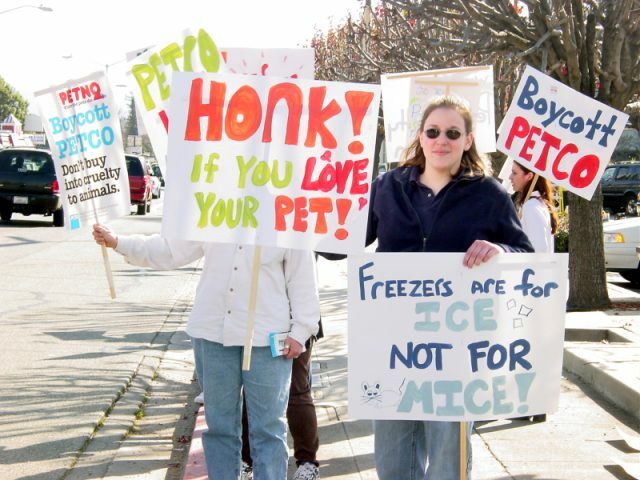 She was a volunteer at the Peninsula Humane Society and has done many education days/events both there and in classrooms. She has fostered and pig sat for many. 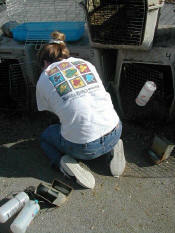 In addition, she does a lot of other behind-the-scenes work in various ways in the guinea pig and rescue world. That doesn't even begin to scratch the surface of appreciation for what Jackie has done and continues to do. Leah has selflessly donated her home to foster and her time to helping the rescue not just for a few weeks, but consistently week after week, year after year. She participates in almost every education event that involves Cavy Spirit, and multiple times has created, managed and/or staffed them on her own. She manages most of the adoptable albums and the shelter albums. She has created some excellent graphics and documents that we use during education events. She also helps answer the many and various emails we receive with questions about care, adoptions, and cages. She helps with weekly care and maintenance of the guinea pigs and frequently helps with the adopters on the weekends as well as helping to screen applicants, schedule appointments and coordinate moving pigs to and from foster homes and much more. Both ladies are strict vegetarians and have helped to inspire me on that path as well. Their compassion runs deep and true and strong. Another woman who has been there over the years and continues to dedicate much time, effort, energy, and personal resources is Sharon. 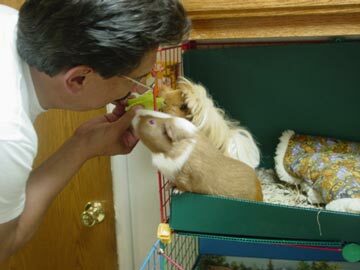 Sharon and her family have shouldered the burden of rescue by being a very significant foster home, caring directly for many guinea pigs, some with significant disabilities and medical issues. 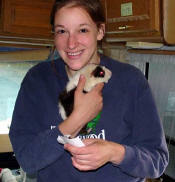 Before she started working with Cavy Spirit, she was also working with another rescue in the area. 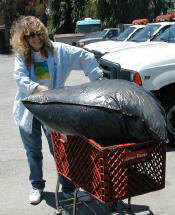 She is always willing to help in many ways and was a life saver during the Hollister rescue, the Monterey rescue, and many others. 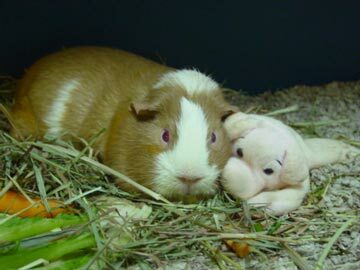 Sharon still has a number of guinea pigs from the Monterey rescue that she continues to foster. 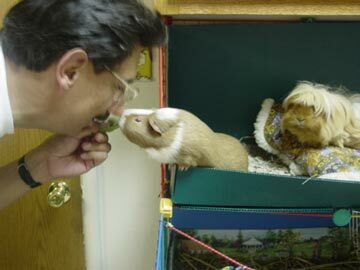 These harder-to-place cavies have been in her care for over two years now. And she's had other special needs guinea pigs even longer. The list of volunteers and supporters goes on and on. Becky, who gave up her teacher's summer of fun for a summer of cavy chaos, was not only a regular in the Hollister effort, but was co-pilot on the intense adventure of the Piggiebago across the country and back with Jackie and Sophie and Jay. Ellie, who spent many weekends and week days helping to clean and feed pigs, and Briana, Karen, Michele, Kara, Bob, Jim, Ken, Linda, Nancy, . . . . so, so many people. Goodness, no. I wish it were possible. I work very full-time and spend the rest of my time on the rescue. I need to have a full time job to support the rescue. 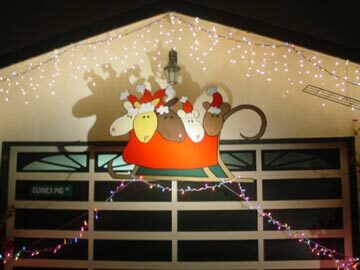 Cavy Spirit gets a few donations from some wonderful people, but the vast majority of the expenses are paid directly by us. We didn't start out as breeders or cavy fanciers or anything special. Robert and I were just both saps who fell in love with cavies. Actually, it's Robert's fault. 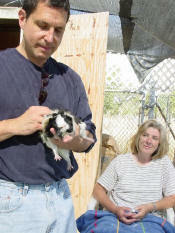 He had a guinea pig when I met him. We were both in 'start over' phases of our lives. Someone needed to find a home for a piggie and he took her in 1996. He had Babe in his bachelor pad and she lived on a diet of carrots and pellets. She was getting neglected as our dating got more involved, so she moved in before he did! I continued her diet, but she seemed kind of 'mopey,' so I went to the pet store and bought a book. That's how I learned a little bit more and discovered that they are social animals. So, I decided she needed a pal. Not knowing any better, I checked the yellow pages and called all the pet stores looking for guinea pigs. We looked at some. Robert fell in love with one while I was away on a business trip. This guinea pig was in the back room and was pregnant. She looked a lot like Rodney in Dr. Doolittle. She actually wheeked when the store owner opened the refrigerator door and rattled a plastic bag with lettuce. 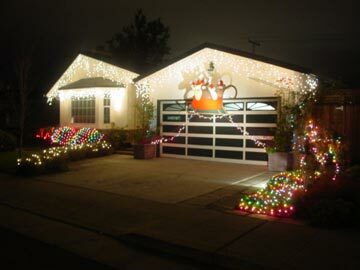 Well, poor Babe had never wheeked a day in her life, so Robert thought, this was really great! Of course, the store owner didn't want to sell his "breeder." But once I got back from my trip and took a look, I was determined. He sold her and said we could bring back any babies we didn't want (if only I knew then what I know now!). She sure was pregnant! She later delivered five healthy pups. We were torn, but decided to keep two--that would give us a total of four guinea pigs. We thought we were keeping two girls. We regretfully and stupidly took the three young males to the pet store to be sold. The runt of the litter, Rose, turned out to be a Ralphy. Well, I knew I needed to take him in to get neutered. The book I read said 6-8 weeks for sexual maturity. And I let it slide a couple of more weeks, being very stupid. Well, Ralphy managed to get his sister pregnant and his mother pregnant again. Now I needed to start doing some serious research. I hit the internet with a vengeance. Found all kinds of things, including a lot of heartbreaking stories. I finally realized I should have gone to the shelter in the first place. I thought, well, I'm going to go check out our local shelter, just for the heck of it. Got there and discovered quite a few cavies needing homes. There was one in particular that I liked, a black crested female American who had been there a couple of months already. I thought and thought about it. Then I thought, "What the heck am I doing here? I've got four guinea pigs at home, and two are pregnant!" So, I went to leave the small animal adoption room, and as I had my hand on the door knob, the female, who hadn't said much of anything while I was next to her, wheeked very loudly. I swear she was saying, "Come back, come back!" and begging me to take her home. That was it! I said to her, "You are coming home with me!" So now I have 5 guinea pigs, was getting one neutered, and two are pregnant! The two delivered within 24 hours of each other. The births are another story altogether. The sister (Little Lucy) delivered 4 healthy babies just fine. The next night (I was traveling home from Chicago), Big Lucy (her mother) had delivered 4 healthy pups but was still in labor with the fifth. She required emergency vet care at 1am to manually extract the last and overly large baby. You could hear her screams outdoors in the parking lot when they got that baby out. She has never been a friendly pig to this day. All my fault, of course, for being a stupid, irresponsible pet owner. 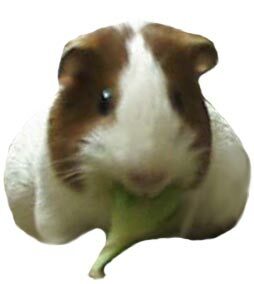 Anyway, now we are up to 13 guinea pigs! Our cage experimentations and concoctions are growing and evolving. Some time goes by with more involvement with cavies and pet stores and the internet. Now I start to think about maybe doing rescue. I clearly remember thinking, "What's one or two more?" So, we did a little more homework and decided to do it. I gave the Peninsula Humane Society our name. The entire Bay Area had Sharlene listed as the only rescue. No wonder she has so many. The first call we got from PHS (Peninsula Humane Society) said they had 8 pigs in pretty bad shape. They were "unadoptable" and would likely be put down. They were found abandoned in a box in a Safeway parking lot. When we went to look at them, it was a truly pathetic site. In fact, there were 10 and one was pregnant. They all had mites. One female abby we named Chalupa because she looked like the Taco Bell dog. No hair anywhere except her head. So we went from 13 to 23 overnight. Shortly thereafter, the pregnant sow delivered 5 healthy pups. So the count went up to 28! In fact, the mother was later paired up with Big Ralphy (our original boar). She was the last pig of that original group to be adopted out. She was a sweetie. She was with us for over a year and half! We still have Big Lucy and Little Lucy. 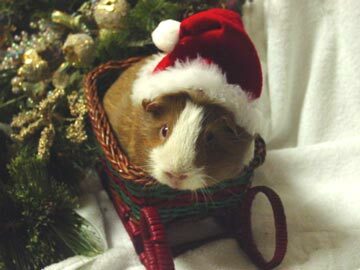 Buddy was probably our most special and all-time favorite guinea pig. Buddy and Tina (for Tina Turner!) were a team. Tina will be here forever, as a permanent resident. However, Buddy has since passed away. We've made our share of mistakes along the way. We always try to learn from them. We try as much as possible to help educate others about important issues as well as the finer points of care and responsibilities of owning guinea pigs. Hopefully, others will learn from our mistakes and won't need to repeat them. Some nights you can't sleep for worry of a pig or a situation that you have no control over. Some days you feel like you aren't even making a dent in anything, that what you are doing is useless. Some days I hate that these animals are in cages at all, despite my efforts to get all piggies in bigger cages. Some days I wonder if I'm sacrificing our future for the here and now of these piggies. Some days, everything clicks with you and your piggies and they provide such joy and fulfillment. Clean cages, lots of green hay, fresh yummy vegetables, cool crisp water bottles, piggies running and popping everywhere. It doesn't get much better than that! Seeing a piggie going to a new home that you know is totally wonderful is also a happy relief. Getting positive feedback on the work you do helps keep the sad days and sad times to a minimum. Please visit our Rainbow Bridge page. My favorite "you know you are a cavy slave when" story is when I was sitting at my desk eating some M&M's that I had put into my jean shirt pocket (I was hiding the fact that I was eating them from Robert!). I popped one in my mouth and thought, yuk, this tastes like a pill or something (that's what it felt like with my tongue). I took it out of my mouth, and YOU GUESSED IT! It was a piggie poop! eeeeyuk. But, with the number of little piggie treasures undoubtedly buried all over our house, it actually didn't seem like a big deal. Our current permanent residents can be found in this album. Buddy has since passed away, but will remain in our hears forever. On the left is Buddy. Named Buddy because he's everybody's buddy -- such a friendly piggie. On the right is Tina. Named for her Tina Turner hair and diva attitude. Robert teasing Buddy and Tina below. Created from scratch with a guinea pig friend. 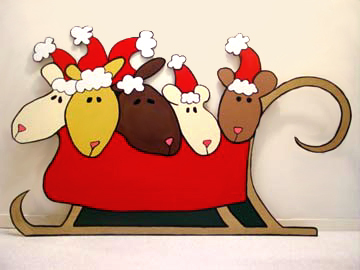 Turned the boat from our logo into a sleigh on 1/4" plywood, painted and varnished. Finished, it's about 6 1/2 feet by 4 feet.